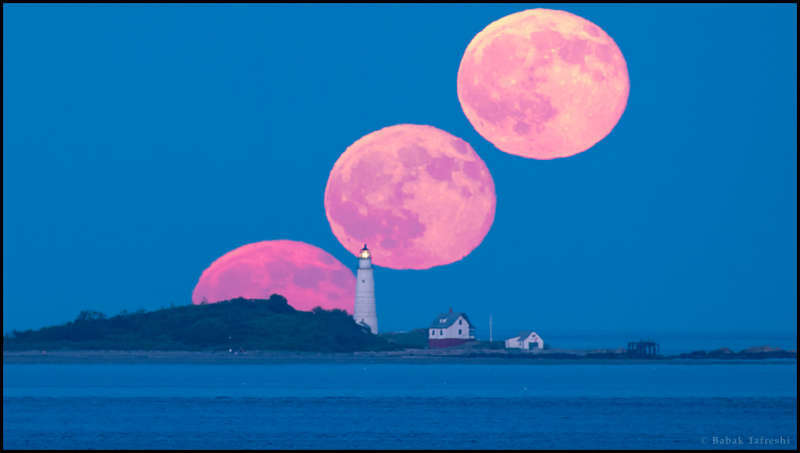 Explanation: This well-planned telephoto timelapse captures July's Full Moon rise across outer Boston Harbor, Massachusetts, planet Earth. In the foreground, the historic terrestrial beacon is known as Boston Light. July's Full Moon is known to some as a Thunder Moon, likely a reference to the sounds of the northern summer month's typically stormy weather. But the eastern sky was clear for this video sequence. Near the horizon, the long sight-line through atmospheric layers filters and refracts the moonlight, causing the rising Moon's reddened color, ragged edges and distorted shape.